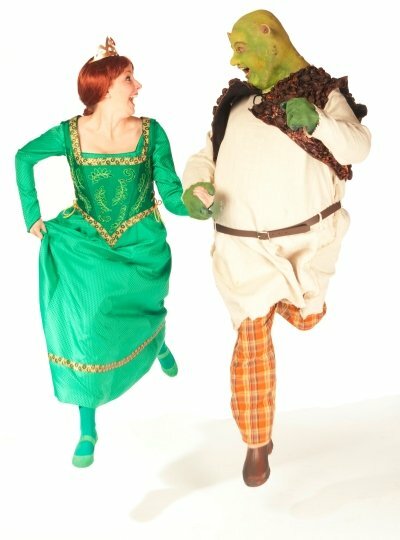 Lindsay Warnock as Fiona and Matt Palmer as Shrek and in the Theatre Under the Stars production of Shrek: The Musical. With the roles of Pan in Bat Boy and The Cat in the Hat in Seussical already under his belt, Vancouver actor Matt Palmer has plenty of experience playing fictional characters to draw inspiration from as he becomes the big green ogre this summer for the Theatre Under the Stars production of Shrek: The Musical. [pullquote]“We can all relate to be being an outcast or not being loved at times. Shrek is such an interesting character as an ogre, but he also has a great big heart. 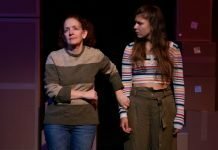 People assume he will eat them, but that is not who he is.” – Matt Palmer[/pullquote]“It is a lot of fun playing non-human roles because other than being inappropriate or rude there are no rules because no can say that is not what an ogre would do,” laughs Palmer. “There is a wonderful freedom that allows you to explore your silly creative side”. A fan of the movies, Palmer also found himself attracted to the idea of being a show that operates on multiple levels, much like what he remembers from the old Warner Brothers cartoons he grew up with. But don’t let Palmer’s love for the movie upon which the musical is based fool you into thinking his performance will be a simple impersonation Mike Meyers performance. What also won’t change of course is Shrek’s recognizable appearance, with Palmer spending nearly two hours each night getting into the costume, prosthetic and green make-up that transforms him into the irascible ogre, and another hour to get out of it at the end of show. Lindsay Warnock as Fiona and Matt Palmer as Shrek. And while Palmer becomes the larger-than-life ogre thanks to some large padding that transforms him from an average guy into a formidable force of green nature, beneath it all is the true heart of the musical. For Palmer finding that heart is not as difficult as one might expect as he uses his own experiences as an outsider to draw upon for inspiration. “Whether it is those times where my love has not been returned or my friendship has been unwanted, we have all been outcasts at some part in our lives,” he says. But even as Palmer delves into the more emotional side of the story, he just as quickly turns things back to the sheer fun of being able to play someone like Shrek, with no better example than the shows infamous farting scene between Shrek and Fiona, played in this TUTS production by Lindsay Warnock. Shrek: The Musical plays in repertory with Legally Blonde: The Musical at Malkin Bowl in Stanley Park from July 11 – August 23. Visit http://tuts.ca for tickets and information.